Pugu5l.com adware is the program that causes slowness of your browser and constant freezes. Pugu5l.com is a potentially unwanted program that injects advertisements to every page you visit to generate revenue for the publisher. Unfortunately, when you get redirected to this website, it is not enough to exit the window or pop-up ad if you want to get rid of the main adware program which is causing all this intrusive behavior. This program uses social engineering tactics to lure people into visiting affiliated or somewhat related pages because all this traffic makes the profit for the sponsor and commercial publisher. Nevertheless, this adware app might install rogue browser extensions on the infected browser app, modify its homepage and new tab zone. Note that, these programs infect mostly the Chrome browser but can also appear on others such as Firefox or Explorer. Although Pugu5l.com virus is called like that, it is not a malicious program that permanently damages your device. However, this is also not a program that you should keep on your computer. Adware-type programs are geared to promote other PUAs or installation of questionable software. Once you have the adware on your computer, just wait for another potentially unwanted program (e.g. browser hijacker) to appear. 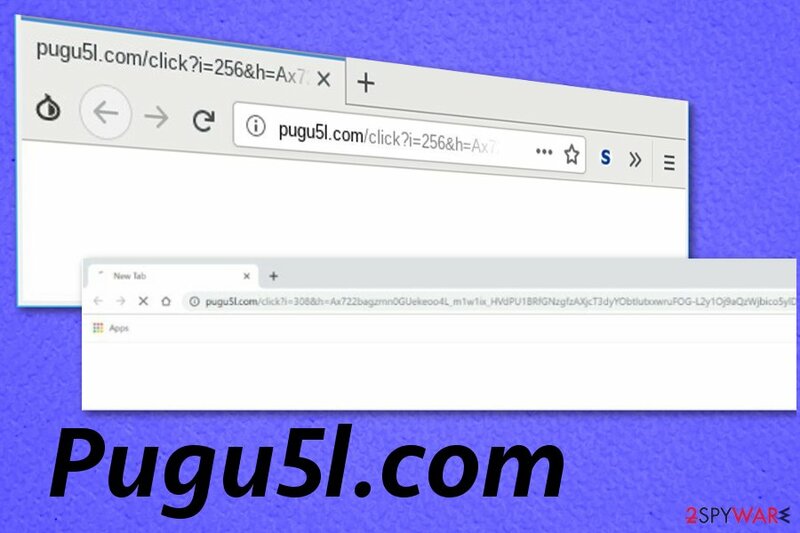 Unfortunately, Pugu5l.com can initiate the installation of browser toolbars, extensions or tools automatically and without your permission. Once the potentially unwanted program gets installed on the system, it stars affecting your browsing online, the speed and performance of your computer. Note that, you are very likely to discover unpleasant changes on your browser's homepage, new tab URL zone, and other similar locations. banners, pop-up ads with various commercial content. You should remove Pugu5l.com from the system as soon as possible, so all suspicious processes and programs can be terminated. For this job, you should employ a reputable tool like Reimage that is capable of detecting potential threats and fixing the virus damage. However, if you have been experiencing advertising posts that are related to this program only on suspicious websites, you can stop the intrusive activity even easier. Remember that if you see a “Confirm notifications” message, make sure that you do not click to allow such posts from appearing, however, if you do, frequent advertising might start bothering you on specific websites. 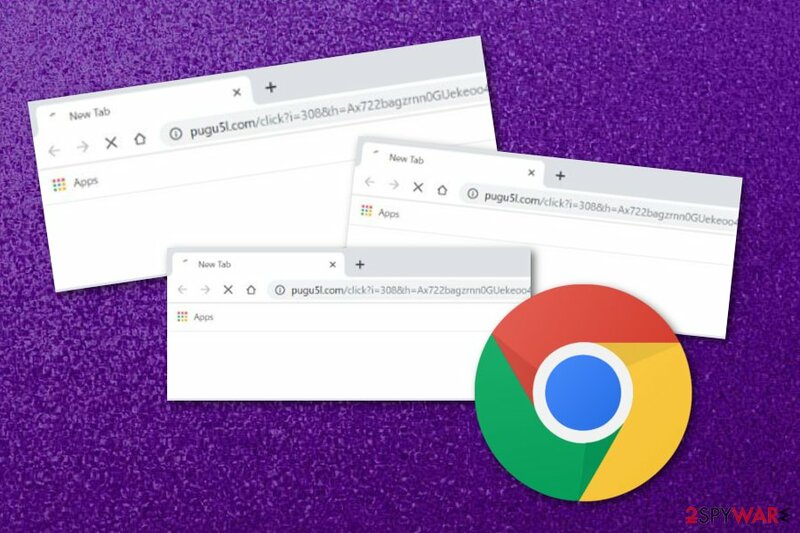 In order to prevent the way for Pugu5l.com pop-up ads, you can download and install a browser tool known as AdBlock or AdBlock plus. As long as you have this component, no ads will be able to trigger you. However, if the ad flow appears on many pages, there is a big possibility that an adware application is responsible for all unwanted changes. In addition to intrusive content delivery, potentially unwanted programs are known for data tracking and collecting. Adware can access information about your online browsing preferences and other more sensitive details like emails or location. To end this behavior perform the Pugu5l.com removal and clean your system entirely. Pugu5l.com is the virus that delivers commercial content directly to your screen. When you get programs from the internet, you risk installing other applications on the system that may lead to cyber infections. Unfortunately, users tend to go the easier route and download programs from free websites (especially Torrents, The Pirate Bay, and similar ones), skip through installation steps. However, these habits lead to PUP infiltrations. Researchers note that it is crucial to choose Advance or Custom installation options so that you can de-select all unwanted programs from the suggested list. Also, choosing official software provider websites and purchasing legitimate programs can give you the advantage. For further protection, we recommend purchasing a reliable antivirus computer program that will take care of your computer system and its components all the time. What you need to do is make sure that the tool always operates properly, i.e. check for the latest updates and perform them regularly. 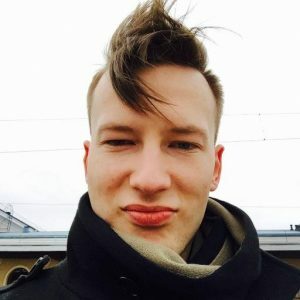 Choose reputable tools for Pugu5l.com removal and download them from legitimate websites to avoid additional infiltration. The best type of tools for this job – anti-malware programs. You can use your reliable antivirus tool or choose from our suggestions below. This type of software has the ability to get rid of all unwanted components within minutes. Make sure to remove Pugu5l.com and all possibly malicious files as soon as possible. When you scan the system, the program indicates all dangerous or corrupted files, applications and you can delete them all with one press of the button. After performing this process, ensure that all browsers are also cleaned from all changes and adware content. Here, look for Pugu5l.com or any other recently installed suspicious programs. Wait until you see Applications folder and look for Pugu5l.com or any other suspicious programs on it. Now right click on every of such entries and select Move to Trash. When in the new window, check Delete personal settings and select Reset again to complete Pugu5l.com removal. Once these steps are finished, Pugu5l.com should be removed from your Microsoft Edge browser. Here, select Pugu5l.com and other questionable plugins. Click Remove to delete these entries. Now you will see Reset Firefox to its default state message with Reset Firefox button. Click this button for several times and complete Pugu5l.com removal. Here, select Pugu5l.com and other malicious plugins and select trash icon to delete these entries. Click Reset to confirm this action and complete Pugu5l.com removal. Here, select Extensions and look for Pugu5l.com or other suspicious entries. Click on the Uninstall button to get rid each of them. Now you will see a detailed dialog window filled with reset options. All of those options are usually checked, but you can specify which of them you want to reset. Click the Reset button to complete Pugu5l.com removal process. ^ Forrest Stroud. Anti-malware. Webopedia. Technology terms . This entry was posted on 2019-02-11 at 09:51 and is filed under Adware, Viruses. You can quickly scan the QR code with your mobile device and have Pugu5l.com manual removal instructions right in your pocket. How did you remove Pugu5l.com?